Watches2U.com are giving away a watch from their collection each day! If you want to be in with a chance of winning a watch from them, simply visit their site and follow the instructions. 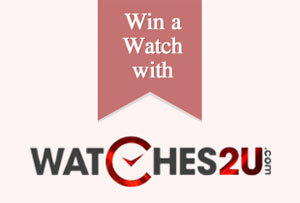 Visit Watches2U.com and click the “Daily Watch Giveaway” link at the bottom of the page. To get involved you’d need to provide your email address, or select that you want to enter using the social network site Facebook. And if you aren’t lucky enough to win today, you can try again the next day! Be sure to check the ‘Prize Giveaway Information’ for more details.